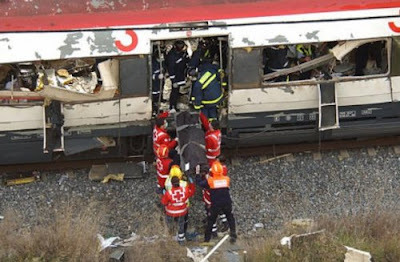 On 11th March 2008 Madrid marked the fourth anniversary of the terrorist bombings (above) that claimed the lives of 191 people and wounded 1,856. It was the biggest terrorist attack in the history of Spain and, indeed, Europe, with 10 simultaneous explosions on four of Madrid’s district trains at the height of the morning rush hour. It happened a few minutes before 8 a.m. Later, the police exploded another two bombs that had failed to go off and a third was defused, leading to the identification of those responsible. The ceremony of remembrance for those who were killed began at twelve noon in front of the monument inaugurated last year which stands in Plaza de Atocha. It was led by their majesties King Juan Carlos and Queen Sophia, who laid a wreath at the foot of the monument. After a minute’s silence in memory of the victims, there was a rendition of the Estonian composer Arvo Pärt’s “Da pacem, Domine”, a work commissioned by Jordi Savall for performance at the Barcelona Forum of Cultures in June 2004. Inspired in the Gregorian chant Danos la paz Señor, the piece was composed only two days after the tragic bombings as a tribute to the victims who were honoured at the ceremony of remembrance. Arvo Pärt’s “Da pacem, Domine” will be included in a forthcoming Alia Vox release. In the words of Raimon Panikkar “It is difficult to live when there is no external peace in the world around us. It is impossible to live without inner peace, if there is no peace in our hearts”. Arvo Pärt’s Da Pacem Domine is a prayer for those whom we have lost, as well as an invocation to peace and hope, the music creating a space of peace, both in the world around us and in our hearts. 'For Inner and Outer Peace' is the title of an important book by another great musical humanitarian, Antal Dorati. It was published by International Physicians for the Prevention of Nuclear War (IPPNW), but is out of print. All this ... and what for?